Termites can cause severe damage to a property, but can they be harmful to humans and other animals? Quick answer: They can bite you or your pets, but the likelihood that they would is very slim. Let’s take a look at termite behavior and see why you shouldn’t worry much about termites attacking you and your loved ones. Termites are slow-moving creatures, and they like to retreat in dark and obscure areas in order to enlarge their territory. There are winged termites that moves at a faster speed, but they are not inclined to harm humans and other animals unless they are provoked. Termites have a caste system that is similar to ants and other hive type insects, which includes the reproductive class, worker termites, and soldier termites. Among these three classes, the soldier termites have the most capability to bite humans, because they have large heads and strong mandibles designed to protect their colonies from other predators. However, they typically don’t attack people and pet animals. In fact, cases of termite pinches are very rare and unusual. Should I be Worried of Termites Attacking my Family and Pets? Basically, you shouldn’t be worried about termites biting you, your family and your pets. Cases of termite bites are very rare, and when they do happen, they don’t have any adverse effects that may warrant a trip to the emergency room. A Termite bite is not dangerous and will not get in the way of your usual routine. Typically, it feels like a small pinch or itch and may appear like a small red bump. It doesn’t cause any severe infection and normally goes away in a span of 1 to 3 days. If you’re manifesting worse symptoms and if the bite has been evident for more than a few days, it’s time to consult a doctor. Chances are, it’s not a termite that attacked you but another form of insect that may have a more toxic effect on humans. The true danger of termite infestation is not directed at humans and animals per se, but it can be harmful to a person’s way of life because these pests target the home—which is human territory or shelter. Termites can inhabit both new and old structures and feed on them. They can cause damage to your home’s foundation, floors, ceilings, and even your carpets. If you find creatures in your home that look like white ants, traces of dirt that’s similar to dust or look like shredded wood, and piles of small insect wings that look like fish scales, there may be termites pestering your property and you need to address it right away. Call a professional pest exterminator and schedule an inspection with them as soon as possible. It’s also advisable to schedule regular pest inspections for your home and other properties. This will help fight termites and other pest problems early on, and spare you from huge costs due to extermination and extensive home repairs. If you think you have a termite situation or if you simply want to make sure that pests are kept away from your home, Varsity Termite and Pest Control in Mesa can help you. 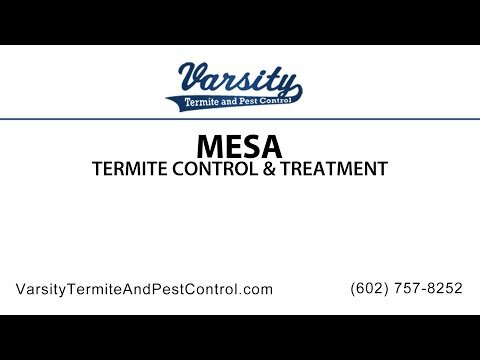 We have licensed Mesa pest control professionals that are ready to provide solutions for you and your home. If you want to know more about our services, please get in touch with us today.